When choosing a sleeping pad for backpacking and camping, it’s best to consider its weight, durability, size, thickness, insulation, comfort, and price. Here are our picks for the best 10 sleeping pads available today based on these dimensions. Many of these sleeping pads are available in different lengths, widths, and weights, making it easy to find a good choice to fit your needs. The NeoAir XLite is the most popular inflatable sleeping pad sold today and for good reason. It packs up small and flat, taking up little room in a backpack. The XLite is 2.5 inches thick, providing plenty of comfort for side sleepers and back sleepers, with an R-value of 3.2 which will keep you cozy down to 20 degrees F. The XLite is available in a variety of widths and lengths, with the 72″ x 20″ regular size weighing in at just 12 oz. Price Range: $130-200. The NeoAir XTherm is nearly identical to the NeoAir XLite but has more insulation and a tougher cover fabric for greater dependability in cold weather and winter. It also packs up small and flat, taking up little room in a backpack, despite having more insulation. The R-Value of 5.7 will keep you warm down to 40 below zero F, while the inflatable 2.5 inch pad provides plenty of cushion for side sleepers. The NeoAir XTherm is available in a variety of widths and lengths with the 72″ x 20″ regular mummy size weighing in at just 15 oz. Price Range: $200-240. The NeoAir Uberlite is the lightest weight air mattress in the NeoAir product line weighing just 8.8 oz in a regular 72″ x 20″ size. With an R-value of 2.0, it has a lot less insulation value than the Therm-a-Rest XLite or XTherm sleeping pads, limiting its use to warmer summertime temperatures. But if you want to switch from an ultralight closed cell foam sleeping pad like the ZLite Sol, the Uberlite will provide a huge increase in comfort without any weight penalty. You can also stack the Uberlite together on a foam pad in colder weather to increase its insulation value and extend its range of use. The NeoAir Uberlite is available in a variety of widths and lengths. Price Range: $180-210. The Therm-a-Rest Z Lite Sol is an ultralight, inexpensive, and virtually indestructible foam sleeping pad, making it a favorite among ultralight backpacking fanatics and boy scout parents alike. Made with closed cell foam, it folds up into accordion-like sections making it easy to carry and attach to the outside of a backpack. One side has an aluminized reflective coating with radiates your body heat back at you. With an R-Value of 2.8, the Z Lite Sol is a three-season pad that will keep you warm to 20 degrees F. A size regular (72″ x 20″) weighs 14 oz, but it’s also available in multiple sizes. You can trim a foam Z Lite Sol with scissors to shave off gear weight. Price Range: $35-$45. The NEMO Switchback is folding accordion-shaped closed cell foam pad with a reflective coating, like the Therm-a-rest Z Lite Sol. The only real difference between the two is that the Switchback folds up slightly smaller when folded up. NEMO doesn’t test the R-Value of their pads (yet) but we estimate that it’s identical to that of a Z Lite Sol at R=2.6. A size regular (72″ x 20″) weighs 14.5 oz, but it’s also available in multiple sizes. Like the Z Lite Sol, you can cut a Switchback up to save gear weight or reshape it for a specific purpose. Price Range: $40-$50. The Big Agnes Q Core SLX is a super comfy, but lightweight inflatable sleeping pad, that’s a whopping 4.25 inches thick and tailor-made for side sleepers. Rated down to 15 degrees F, the Q Core SLX is covered with a luxurious quilted top with flat valves for increased durability and rapid deflation. A regular sized (72″ x 20″) Q Core SLX weighs 16 oz, but the pad is also available in a very wide variety of lengths and widths. Price Range: $140-$220. 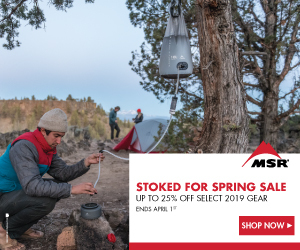 The MassDrop Klymit Ultralight V is an inflatable pad that weighs 15.2 ounces (72″ x 20″) and has an R-Value of 4.4, making it ideal for spring or autumn backpacking and camping when the ground temperature is cold and you need a little extra insulation. It’s made with a durable 20D polyester fabric for extra durability, with a dual flat valves for fine tuning the inflation level. It features lofted air pockets with a depth of 2.5″ with side rails to keep you comfortably on the pad. It’s also available in multiple sizes. Bargain priced at $60. Read SectionHiker’s NEMO Tensor Insulated Air Pad Review. The NEMO Tensor Insulated Air Pad strikes a good balance between a light weight and comfort. Three inches thick, it provides plenty of clearance for the bony hips of side sleepers, with a minimal compact size when deflated. Weighing just 15 ounces (72″ x 20″), the Tensor has two internal reflective layers and a flat valve for increased durability. NEMO doesn’t yet test the R-value of their sleeping pads, but rates the Tensor Insulated down 20 F. The pad includes an inflation storage sack and is available in multiple sizes with both mummy and rectangular shapes. Price Range: $160-$180. The Sea To Summit Ether Light XT Insulated Sleeping Pad has extra thick 4″ air sprung cells provide excellent comfort for side and back sleepers. ThermoLite synthetic insulation and a platinum liner reflect warmth back to you to minimize radiant heat loss. A flat valve makes it quick to inflate and deflate, and a combination stuff/air pump is included for ease of use. The Ether Light has an R-Value of 3.8, making it suitable for three season use, while a size regular (72″ x 20″) weighs in at 15 oz. Multiple sizes are available. Price Range: $190-$210. The Sea To Summit Ultralight Insulated Sleeping Pad has 2″ thick air sprung cells that adapt to a sleeper’s curves like the mattress of their bed at home, providing excellent comfort for side and back sleepers. Flat valves make it quick to inflate and deflate, and a combination stuff/air pump is included for ease of use. The Ultralight has an R-Value of 3.3, making it suitable for three season use, while a size regular (72″ 20″) weighs in at 16.9 oz. Multiple sizes are also available. Price Range: $130-$150. Choosing a sleeping pad requires prioritizing across multiple factors, some of which can be at odds with one another. THICKNESS: Thicker sleeping pads are often more comfortable for side sleepers because they provide more cushioning under the hip bones. Depending on their length and width, it may take more breaths to inflate a very thick air pad, something to factor into your decision. LENGTH AND WIDTH: Most popular sleeping pads are available a wide range of lengths and widths. While large pads are often more comfortable, they’re often heavier. Most pads are available in a standard 72″ x 20″ size. But many pads are also available in longer, shorter, and wider sizes, or mummy and rectangular shapes. WEIGHT: A sleeping pad is one of the most important items on your gear list in terms of comfort and sleep insulation. While the weight of all backpacking gear matters, don’t make the mistake of being miserable at night by choosing a pad that compromises the quality of your sleep, simply to reduce the weight of your gear list. COMPACTNESS: The size and compactness of a sleeping pad can be an important fact depending on your style of packing and the size of your backpack. Inflatable pads usually pack up smallest, self-inflating pads are usually larger, and foam pads are the largest. Depending on how you pack, foam sleeping pads may need to attached to the outside of your backpack because they’re so large. While closed cell foam pads don’t absorb water if they get wet, you’ll want to dry one off before you put a sleeping bag or quilt on top of it, after a wet day on the trail. DURABILITY: Foam sleeping pads are the most durable, self-inflating pads are the next most durable, and inflatable air mattresses the least. Inflatable pads tend to fail in two places: the valves and at the seams of fabric. Flat valves that are flush with the surface of the sleeping pad are more durable than stick valves because they have no moving parts and can’t catch on obstructions. Check Out All of SectionHiker's Gear Guides! Disclosure: Therm-a-Rest, Klymit, Sea-to-Summit, Big Agnes, Exped, and NEMO have all provided the author with many free gear samples for testing and review during the past 10 years. I have the Massdrop Klymit, but after two years, it has started losing air overnight, bottoming out in the middle of the night, which is really uncomfortable in the cold. Luckily, on the last trip with the Scouts, I had an old Thermarest Prolite Plus in the trunk and swapped over to that for the second night. I’m now in the hunt for a new mattress. Any feedback on mattresses that do NOT work with quilts or sleeping bags that use little or no insulation on the mattress side? I’ve recently purchased a ZenBivy bed — not as light or compact as my current REI Igneo but really comfortable — and I now understand that the Klymit mattress relies on some sleeping bag insulation lofting in the deep channels to provide insulation. I’m a big fan of Thermarets NeoAirs in terms of durability. I have a 7 year old XLite and a 5 year old XTherm. Bomber and lifetime guarantee. Yadda Yadda. R-value is R-value irrespective of whether your sleeping bag or quilt has bottom insulation. The only caveat would be for pads that have big air channels where heat can escape, like the MassDrop Klymit. You want a pad that your sleep insulation can lay flush against. Thanks. The main competitor was the NEMO Tensor, but OutdoorGearLab gave it a lower score on durability. Interesting the Exped did not make the top 10…. Too many QC issues? Exped is focused on making car camping mats these days, like the MegaMat. These are designed to be carried on your back, not a camper. For some reason, though, i have noticed that Exped stuff doesn’t show up in the stock of many U.S. retailers, even online. I have a few of their pads. The Synmat HL lite, tapered, rounded corners, almost three inches thick, the long/wide version. With the stuff sack, Schnozzle inflation bag, and repair kit, weight comes it at about 20 ounces. Similar weights for Downmat HL winter pad and an older Synmat 7 pad i keep around as a backup. No holes or blowouts yet. A main reason i like them, aside from just being comfortable, is that they don’t make the potato-chip-bag noise that some of the other, slightly lighter pads i’ve checked out. Some people find the pool-raft-shaped baffles offputting, but with the right level of inflation, i don’t notice any hill-and-valley effect. Cant wait until you review the Thermarest Apex pad. Phil, thanks for the review. Howsomever I think you should have included the REI FLASH air mattresses. With both I use the valve-compatible Sea to Summit pump bag/dry bag. Very fast inflation and no moisture gets in the mattress. The pump/dry bag serves as a dry bag for clothes. I just roll is done to fit the quantity of clothes inside. Dual use gear is the backpackers goal.